I was first inspired to write a column about ice cream around the festival of Shavuot—a time when dairy foods are traditionally enjoyed. Because it is also a time of warming weather, these foods are often frozen treats. Now that summer is upon us, the urge for ice cream is only getting stronger. 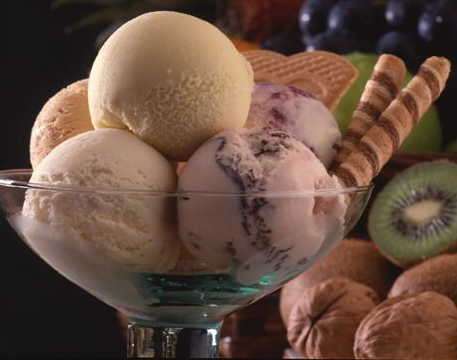 Here is my "just in time for summer" plug for the many great ice cream parlors in our area purveying kosher ice creams, along with some easy, delectable frozen desserts you can whip up in minutes at home. Ice cream most likely dates back to the 4th century B.C.E. Early references include the Roman emperor Nero (37-68 C.E.) who ordered ice to be brought from the mountains and combined with fruit, and Chinese Emperor Tang (618-697 C.E. ), who had a method of creating ice and milk concoctions. It eventually was brought from China to the Italian and French royal courts, and made its way to the New World, where it was served by several famous Americans, including George Washington and Thomas Jefferson. Ice cream’s Jewish connections include three highly successful Jewish-owned ice cream businesses—the Baltimore based Hendler Ice Cream, Dove Bar, and Ben & Jerry’s. Founded by L. Manuel Hendler in 1905, and bought by the Borden Company prior to 1932, Hendler’s was known as "the velvet kind." In the 1940s—long before modern technology made edible photos on birthday cakes commonplace—Hendler adapted photo silkscreening to his custom decorating process, whereby for a reasonable fee a client could have any ''camera-ready'' image translated into Benday dots and printed onto the surface of an ice cream cake. The delectable Dove Bar was created by Nashville, Tennessee, by ice cream mayven Ed Stolman, who sold the company to M&M/Mars for a small fortune. Ben Cohen and Jerry Greenfield were two childhood friends with a sweet tooth. After having invested $2.50 each for an ice cream-making correspondence course, the two set up shop on May 5, 1978 in an abandoned Vermont gas station. The rest is history: Ben and Jerry have become multimillionaires "doing well by doing good," as from the beginning the two entrepreneurs have donated a percentage of every sale to charities that make a difference in the world. When it is so easy to run to the store and have one’s pick of flavors in the freezer section, why make ice cream at home? What you’ll discover is that with a few simple ingredients – milk, cream, sugar, and an endless variety of flavorings – plus the convenience of ice cream makers designed for home use, turning out a pint of fresh ice cream is a snap. And the satisfaction of having made it yourself, along with the reward of the freshest flavor makes it all worthwhile. My husband and I received a Donvier ice cream maker as a wedding gift almost 14 years ago. It continues to bring the family great pleasure. But to get delicious ice cream in Philadelphia, you do not have to make your own. We are blessed to have many good ice cream parlors with kosher supervision. Below, I have listed the address of stores in the Main Line area that have kosher supervision. To help you find the store nearest you, I have provided the each company’s website. Since kosher certification varies from store to store even within the same company, it is wise to call the store directly. Just Chill is the "new kid on the block" and has just opened, offering water ice and soft serve in the Penn Wynne area. It is open all week from noon to 9pm. All questions concerning the kashrut of the establishments featured in this column should be directed to your rabbi. Just Chill is under the supervision of Rabbi Shlomo Caplan of Congregation Beth Hamedrosh. All products are kosher. Water ice is pareve; soft-serve ice cream is dairy (but not Cholov Yisrael). Maggie Moo's is supervised by Vaad Hakashrut/Rabbinical Assembly Mid-Atlantic Region. Since all Cold Stone locations are individually owned and operated, you will need to ask your local store directly if they are certified kosher. The Cold Stone website states that the ice cream mix used to make Cold Stone ice cream is certified kosher. Please note: At all of the above companies, the toppings and mix-ins are generally kosher as well, with the exception of marshmallows and gummy bears. If you are concerned about using raw eggs in your ice cream—as many recipes call for them—look for pasteurized eggs, now widely available in supermarkets. Flavor and texture will not be compromised by your attempts at safety. Add honey. Cook over low heat, stirring constantly until thickened (approximately 10 minutes). Mixture should smoothly coat the spoon. Cool, and then add cream and vanilla. Refrigerate overnight. In a double boiler, combine the half-and-half and fresh ginger and heat over barely simmering water until scalded. Set aside and let steep for 15 minutes. Whisk the sugar into the egg yolks. Whisk in some of the hot half-and-half mixture, return this mixture to the pan, and cook over barely simmering water, stirring constantly, until the custard coats the spoon. Immediately place the pan in a pan of cold water and stir to cool to room temperature. Push through a sieve, discarding the ginger fibers. Stir in the cream and vanilla. Cover and refrigerate the mixture for 2 to 3 hours, or until thoroughly chilled. Freeze in an ice cream maker according to the manufacturer’s instructions. When partially frozen, mix in the chopped candied ginger. This is the easiest and most delicious coffee ice cream. I usually use decaffeinated instant coffee in lieu of the high-test. If caffeine doesn’t faze you, instant espresso also works great, and lends an even richer coffee flavor. Whisk the eggs in a mixing bowl until light and fluffy, 1 to 2 minutes. Whisk in the sugar, a little at a time, and then continue whisking until completely blended, about 1 minute more. Add the cream, milk, and two tablespoons of the instant coffee and whisk to blend. After the ice cream stiffens (about 2 minutes before it is done), add the remaining 1 tablespoon coffee, and then continue freezing until the ice cream is ready. Sorbet can be made with any fresh juicy fruit. If you like kiwis, you’ll enjoy presenting this stunning sorbet as an intermezzo (palate cleanser between courses) or light summer dessert. Combine the kiwis, sugar, and lemon juice in a mixing bowl. Refrigerate covered for at least 1 hour. When ready to freeze the sorbet, mash the kiwis until pureed. Add the liqueur, corn syrup, and water and stir until blended. Ben's Chocolate Ice Cream is about as rich as they come. The pinch of salt helps to bring out the chocolate flavor. This recipe and the recipe for coffee ice cream are from one of the best ice cream cookbooks in my collection Ben & Jerry's Homemade Ice Cream and Dessert Book (Workman Publishing). Melt the unsweetened chocolate in the top of a double boiler over hot, now boiling, water. Gradually whisk in the milk and heat, stirring constantly, until smooth. Remove from the heat and let cool. Whisk the eggs in a mixing bowl until light and fluffy, 1 to 2 minutes. Whisk in the sugar, a little at a time, then continue whisking until completely blended, about 1 minute more. Add the cream, vanilla, and salt and whisk to blend. Pour the chocolate mixture into the cream mixture and blend. Cover and refrigerate until cold, about 1 to 3 hours, depending on your refrigerator. Variation: Chocolate Chocolate Chip: Add 3/4 cup semisweet chocolate chips after ice cream stiffens (about 2 minutes before it is done), then continue freezing until the ice cream is ready.